Residential fences come in many varieties and can provide a wide range of benefits depending on the design. A few common types of residential fences include security fences, picket fences, garden fences, deer fences, and pool fences. Whatever type of fence you need, we can help. Contact us today and schedule your free estimate in Northbrook, IL! Commercial fences can fulfill two very important roles for commercial properties. First, they provide a much-needed layer of extra security in many cases and can be customized depending on how much you want this to be the focus. Second, they provide an attractive exterior that can create a positive impression on customers, clients, and employees. Gates provide an excellent level of security, but they need access controls to be truly effective. Automatic gate operators and access controls provide easy access for your friends and guests while still keeping your property secure. 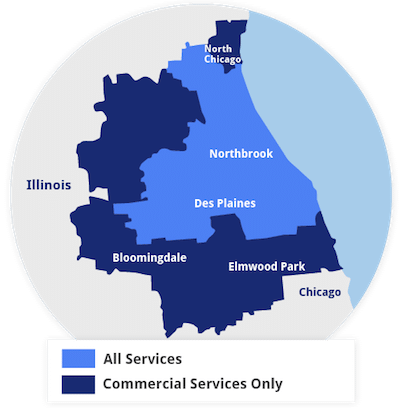 Contact us today and schedule your free estimate for any of our residential and commercial fencing services in Northbrook, IL!